Stunning double row of half carat diamonds with a milgrain edge detail feature on this 9ct white gold wedding band. Celebrate your wedding day with this detailed vintage design. 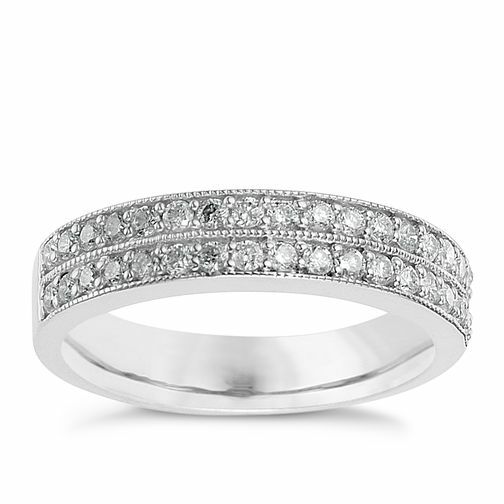 9ct white gold 0.50ct diamond milgrain wedding ring is rated 5.0 out of 5 by 5. Rated 5 out of 5 by Anonymous from Stunning! This ring is absolutely beautiful. The picture doesn't do it justice. Who ever gets this ring either as a gift or whether they buy it as a gift for themselves you won't be disappointed.